The Dark Arks of the Covenant is a new hunt published in February 2002 by club member Terry Lyndon. 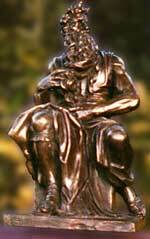 The prize is a 6lb, 10 inch high bronze figure of Moses/Zeus holding two tablets of the ten commandments. The hunt concerns the journey of seven Arks of the Covenant, the defeat of their enemies and the involvement of secret organizations such as the Knights Templar. To cover the cost of the three-page hunt, treasure and postage, Terry asks for £2.50 (as a cheque or in form of UK stamps) plus a C5 or C4 stamped, self-addressed envelope, sent to T J Lyndon, Kingfisher Lodge,18 Lealand Road, Drayton, Portsmouth, PO6 1LY. Surplus funds will be put back into this or future hunts. There is a public discussion of Terry's hunt on the club bulletin board. Return to the site contents or the list of hunts for the general public.